It's a new year, and that means it's time shift into some new habits regarding your keyword research. 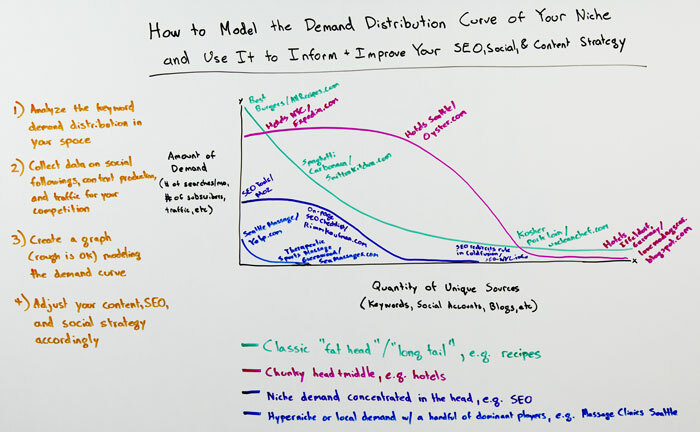 Rather than simply targeting marketing blasts at either the in-demand or the long tail, you may want to think about carefully tailoring your tactics to the shape of your niche's keyword demand distribution curve. In today's Whiteboard Friday, Rand details four steps to using these curves to support and improve your existing strategies. Howdy, Moz fans, and welcome to another edition of Whiteboard Friday. Let's kick off 2016 with a little bit of discussion about something higher level, and that is the demand distribution curve of your particular niche when it comes to content, social media, and SEO. That is, search demand for keywords. What I think we can do here and what I've seen in the past is that folks who understand their distribution of demand, what people want from them and where in the process they want it, have this unique advantage because they can apply tactics that fit with their niche and with their customers' needs so much better than folks who try blasting these marketing tactics that are made for places where there's heavy demand all throughout the demand curve or there's a long tail of demand. They blast these tactics at distribution curves where they don't make sense. I think that probably contributes to a lot of the frustration that marketers see in why their tactics and their strategies don't work. Let me suggest a process for you. 1) Analyze the keyword demand distribution in your space. This sounds fancy. It's not fancy at all. Basically, what I'm saying is go make a list of all the keywords in your space, all the keywords that would bring relevant, high-quality traffic to your site that might potentially turn into customers either on a first visit, second visit, two or three visits in the future. Then, look at that list. Are we talking about a list where a few keywords dominate the demand curve? There are 5 keywords that are getting tens of thousands or hundreds of thousands of searches per month, and the rest is less than 50. Or are we talking about more of an even curve that moves down? You have a few that are getting many tens of thousands, a few in the thousands range, a few in the hundreds range, a few in the long tail, maybe a really, really long tail, and tons of keywords that get 5 to 50 searches per month and there are thousands and thousands of them. You can't even think of them all. If you construct that distribution curve you can do some very cool things. I'll show you that in a sec. 2) Collect data on your social followings, content production, and traffic for your competition. Not just yours but the social followings in your industry. Go to your competition. Go to the media players in your field, that people in your niche pay attention to. Look at all of the subscriber counts. Are you seeing, wow there are, like, tons of accounts that have many thousands or hundreds of thousands or millions of Facebook fans and Twitter followers and Google+ followers and LinkedIn channels and blogs that have all these subscribers and email newsletters that have all these subscribers? Or is it kind of the opposite story, where there's one or two big players who have many thousands and then nobody else has even more than a couple thousand in your space? Oh, well now that's a very steep fall-off for that demand curve. You can model that same thing with the traffic that you and your competition get in the space. Now you get something that looks like this. What you can do is I'm suggesting you create a graph of that distribution. It doesn't have to be a perfect graph. You can put it in Excel or in Google Docs. Or honestly, you know what? You can kind of spitball this one. This is one where it's okay to just look at the curve and be like: "Oh, this is one of those where there's lots of demand for just a few sources, and there's very little demand at the tail end. But there are many, many sources that offer a small amount of information." This has a big long tail. Model these out. When you do that, when you draw this type of a curve, you can infer a ton of things about what types of marketing will and won't work. Let me show you some examples, and then I'll talk about how that shifts strategy. "Recipes" is a space with a very, very classic keyword demand curve model. It's this green line here. You can see up here it's the things that we all search for the most. It's the recipes for the best burgers or the best steak or the best chili or whatever the top 50 recipes that are made most commonly in the United States, in my example, but it could be a country of your choice. Down here we get into some other things that are slightly less popular but still get lots of demand, and there are lots of them, like "spaghetti carbonara." Carbonara is delicious. You've got to get good pancetta. If you can, oh man it's phenomenal. Then all the way down at the end in the long tail we've got "kosher pork loin," which is probably the most oxymoronic recipe search you can come up with. I invite you to do that search. I'm sure there'll be something fascinating there. It's a ridiculous example. You can do this not just with keywords, but with social channels too, and with domains. For example, at the top here allrecipes.com, there are only a few sites that get tens of millions of visits a month, but they have a huge amount of demand, a huge amount of visits. Something like a smittenkitchen.com, which is a recipe site that's lovely and does beautiful photography, it gets a medium or moderate amount of demand. Then over here at uncleanchef.com — I hope no one ever visits that domain, that sounds like that's just a branding disaster — very small amount of demand. You can see that curve, and you can imagine your marketing efforts targeting it. Because there's a big long tail, there's lots of room to create a tremendous amount of content. Because that demand curve shifts up gradually, by gaining more links to all of these and by continuing to produce content, you can have a few hits. Maybe you can even try and target some of these ones and use the links that you gain in the tail and in the chunky middle to help bolster your fat head. There's a lot of opportunity for a classic content marketing play. "Hotels" is a pretty good example of this. Yes, there are a few, like hotels in New York City or hotels at Disney World or those kinds of things, that are very dominant. A few destinations dominate the top 10, but then there's this massive mid market of hotel demand. Then, it falls off pretty quickly. There are only so many places in the world that you can go. The hotel demand gets really, really tiny when you search for hotels in Iffeldorf, Germany, which is where my father-in-law lives. Going out there, it turns out there's one hotel with, I don't know, I think 12 rooms. If you don't get one of those, too bad, you're not staying in Iffeldorf. This works on the demand curve of sites as well. Expedia and Oyster.com might be right in the middle here along with Hotels Seattle, and then IloveMadagascar.blogspot.com. It turns out they haven't posted anything since 2012, but there's a little bit of good information, a small amount of demand. If you're looking at marketing in this space, you really have to say to yourself, "Hey, we're not going to get anywhere until we can reach this chunky middle in terms of demand." We're going to be competing with every single hotel site on the web for all of this stuff because it turns out "hotels in Iffeldorf" is targeted by Expedia just as much as it is the tiny hotelier that runs that little boutique hotel in that tiny town. Now you're playing in a different world. This is niche demand that's concentrated in the head and a little in the middle, for example searches around SEO. It turns out there's not like a "best burgers" or a "hotels NYC" in the world of SEO. "Learn SEO" and "SEO tools," those might be the head terms. Even they only get tens of thousands, not hundreds of thousands of searches a month, because we're a relatively concentrated, niche activity that only human beings who are interested in Internet marketing are searching for. Then, we get into these demands like an on-page SEO checklist and way down here, what about "SEO redirect rules in ColdFusion." That tail trails off a little sooner than these ones where there's just so many massive numbers of people searching that the searches can get into a very unique snowflake-type of territory. We might start with Moz here and then have chunky middle sites like a Rimm Kaufman Group, the consultant group, and then down here like an SEO-NYC.info. I looked at that site. I'm not so sure about that one. Finally, I mocked up another one, my last demand curve, which is like a hyper-niche or local demand with a handful of dominant players. This happens in a lot of industries, like what we'd call "boring industries." I used to do consulting in some of these spaces like commercial real estate, where there was basically one big publisher. All the commercial real estate brokers in the country paid attention to that publication, but not really anything else. They weren't reading blogs. They weren't following social media accounts. It's that publication or it's nothing. You get this very steep curve. Even the highest point of demand is maybe half the height of what it is in SEO because it's such a niche play. This happens a lot in local SEO spaces. If I'm running a massage clinic in Seattle, I only have a few keywords that I really care about at all. There's not this huge long tail of keywords that I can really target. People just aren't doing that much of a breadth of searches. They either want a massage in Seattle or they're searching for not massages in Seattle. Maybe Seattle massage and Yelp.com dominates the results for that. Therapeutic sports massage in Greenwood, which is a neighborhood, very small amount of demand, tail trails off quickly, and maybe SeattleMassages.com. You get a sense that these curves are dramatically different and that the marketing tactics we would pursue, the types of content we would create, the expectations we would have, how we would pitch our clients or our teams internally and what we'd tell them to expect from content efforts, from social media broadcasting, from building those channels, from targeting keywords, it's going to be really different. If you apply the one-size-fits-all methodology to every one of these curves, you're going to encounter failure. For sure you're going to encounter failure. 4) You have to adjust your content, your SEO, and your social strategies according to the demand curves of your niche. I think if you try this exercise, you will find your strategy gets better significantly. All right, everyone, I hope you've enjoyed this early edition of 2016's Whiteboard Friday. We'll see you again next week. Take care.